Commencement 2016: Here we go! The first ceremony, the Advanced Degree Convocation, begins in an hour and a half. The last one, the Plenary Commencement, ends tomorrow morning. See you on the other side. 4 Responses to Commencement 2016: Here we go! Nice. Proving that the legend of the TRG was wrong. Thanks so much for discovering and sharing this fantastic image. Interesting that a female was chosen way back then, and just look how cool and confident she is portrayed…on her way up the ladder…reaching for the “gold”! Pretty progressive choice for Rice and the artist! 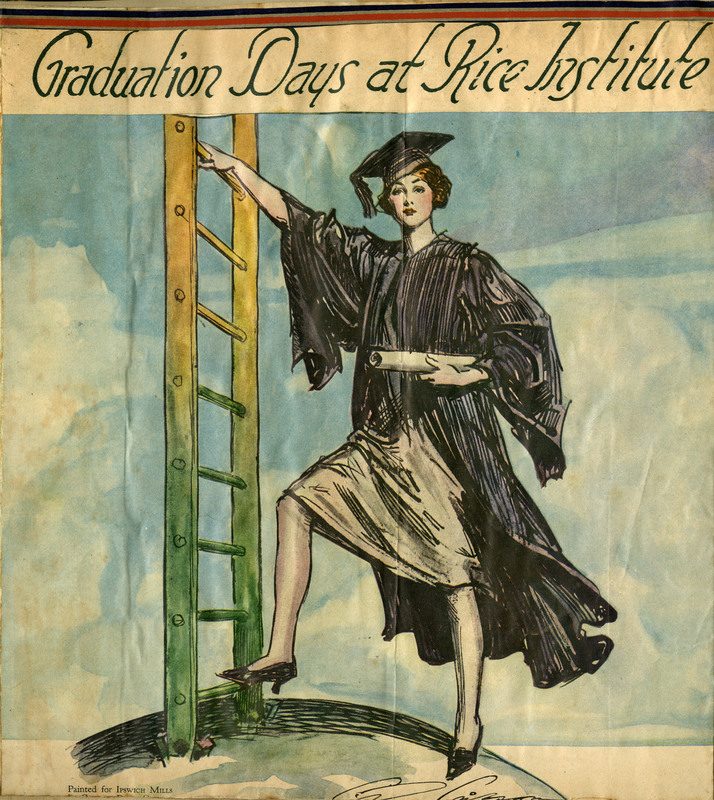 “It depicts a young lady upon her graduation preparing to climb the ladder of success, hopefully wearing a pair of Ipswich Mills silk stockings. “What is really interesting about this advertisement is the small printing which states the picture was painted for Ipswich Mills by Charles Dana Gibson, a very famous artist and illustrator whose work appeared in all the top publications . He was the creator of the Gibson Girls, which had a great influence on the styles and aspirations of females of that time. His signature also appears on the advertisement. One is available now on eBay: http://www.ebay.com/itm/1926-Ipswich-Hosiery-ad-by-Charles-Dana-Gibson-of-Gibson-Girl-fame-632-/252359244594?